Notice the two LED positioning of the light frame on top and the ‘light intensity wheel’ for adjusting the brightness for the light frames on the bottom. The top light frame was used with the IQ 9110 and the light frame with the light intensity wheel was used with the IQ Jr light and sound brainwave frequency mind machine. Which Esprit brainwave entrainment unit do you have? Several days ago I posted information about the Mastermind Esprit system by Synetic Systems (now known as Mindplace). This brainwave entrainment unit contained six sessions by Dr. Rayma Ditson-Sommer and was extremely popular. Not long after that post went up I received an email from Deborah A. including pictures that showed her Esprit unit. It was different! Her Esprit did not have Mastermind Esprit shown on her unit, it had Synetic Esprit showing and her unit contained 12 sessions, not six. At my age forgetfulness is a reality (think CRS) no matter how many memory enhancement sessions I experience. And after 25 years in the light and sound industry there are plenty of things that have happened that I’ve totally forgotten about. That’s why I have kept boxes piled with notebooks full of old news releases, brochures, product information and users guides and manuals. Not to mention old mind machines. 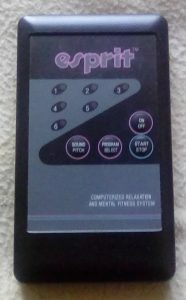 Deborah had asked if I had the 12 session Esprit manual because the post I made showed the Esprit 6 session owners manual. After delving through all the boxes stored from the 1990’s through the early 2000’s I came up empty. There was nothing written about the Synetic Esprit with 12 sessions, just information regarding the Mastermind Esprit with six sessions. So dear readers, have a look at the pictures of Deborah’s 12 session Synetic Esprit and should you have any information about that unit – especially the session list – could you please email it my way in care of store@mindmachines.com? Both Deborah and I would be most grateful… Thanks! Copyright: Michael Landgraf (CA) 2016. All rights reserved. The AllColor Visual System was created by Michael Landgraf of Mindmachines.com and the late Chris Williams of Rybett Controls. The ACVS was the first color spectrum unit designed for use with light and sound brainwave entrainment devices, also known as mind machines, brain machines and psychowalkman. The AllColor Visual System featured left and right independent eye control for color choice, four sliders for each eye that controlled red, green and blue color generation plus brightness control. The ACVS could be used either as a stand alone system for color therapy or connected to a light and sound mind machine for choosing any color in our visual color spectrum – literally thousands of different shades, blends and brightness of color choices. And the system was built utilizing analog rather than digital controls as analog allows the user to gently ramp through color changes whereas digital utilization results in jumps in color changes, which was adverse to fluid and continuous brainwave entrainment. The reason Michael Landgraf and Chris Williams designed the AllColor Visual System was quite simple. At the time (circa 1995) if a light and sound mind machine owner wanted to use a different color stimulation for their mind machine session, they would have to buy a different color light frame. This was unacceptable. Mind machine owners would have to pay anywhere from $30 to $125 for each new color light frame, plus have so many different light frames that storage was a hassle. But mind machine manufacturers did not want to make multi-color light frames because selling individual color light frames was a cash-cow for them. So Michael and Chris made them and charged less than $200 for the entire AllColor Visual System. The result? Within six months light and sound manufacturers started producing multi-colored light frames. All Mr. Landgraf and Mr. Williams wanted was for our clients to enjoy the sensation of different colors while experiencing their mind machine sessions at a cost-effective price. Once the manufacturers stopped being greedy and started producing a variety of colors within each light frame we felt we satisfied our goal and ceased making the ACVS and went back to what we enjoyed most: promoting the benefits and cost-effectiveness of light and sound mind machine neurotechnology. The Lucidity Institute, founded by Stephen LaBerge, Ph.D., created the DreamLight in order for us to increase our ability to dream while asleep yet have complete awareness. Being aware that you are dreaming often occurs in the middle of a dream. We’ve all experienced this at least once, but with the DreamLink you can keep dreaming for up to an hour longer. This knowing that you are sleeping, and dreaming while you are sleeping, is called lucid dreaming. Today there are mind machines, also known as dream machines, brain machines and psychowalkman, that contain delta brainwave frequency sessions for entrainment of your mind to help you fall asleep and remain asleep. This is great for all us who have a hard time going to sleep because of brain chatter, anxiety or too much environmental noise. InnerQuest Technology was originally known as Psych Research. 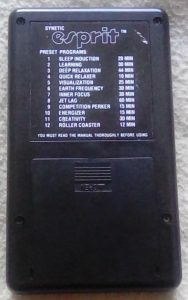 Founded by the late Rob Robinson, InnerQuest produced the finest light and sound mind machines (also known as brain machines and psychowalkman) available during the 1980’s and 1990’s. All of the InnerQuest mind machines produced pulsed light and sound to effectively entrain the brain with brainwave frequency sessions in the beta, alpha, theta and delta states of consciousness. For an example of just how beneficial InnerQuest technology was please read the letter Darby Hewitt wrote to Rob Robinson back in 1992. With the help of leading researchers including Dr. Rayma Ditson-Sommer and Gayland Hearst, Ph.D., InnerQuest set the stage for the acceptance and evolution of light and sound mind machines with many of today’s systems still including brainwave entrainment features first introduced by InnerQuest. The BioLight by Theta Technologies was the first light and sound brainwave frequency mind machine to combine light and sound entrainment sessions with GSR (Galvanic Skin Resistence) biofeedback (much like today’s Thoughtstream by Mindplace) into one simple device. It was a great idea at an affordable price. The best part of the BioLight multi-purpose mind machine was the five integrated light and sound sessions. The relaxation, meditation, energize and accelerated learning sessions were all created by Rayma Ditson-Sommer, Ph.D.. Dr. Sommer was a pioneer in light and sound neurotechnology and considered the leader in promoting the beneficial effects of pulsed light and sound brainwave stimulation. Besides being the best at helping learning disabled and hyperactive individuals achieve peak academic performance at will, Rayma was at her best with pre-Olympians, Olympians and professional athletes. Gary Hall Jr. was her first pre-Olympian to complete her sports performance instruction for the Atlanta Olympic Games and brought home the gold medal. Up untril her passing after the London Olympic Games, Rayma’s students brought home over 50 Gold, Silver and Bronze medals for the United States. The light and sound sessions used for the athletes peak performance training were based on the sessions associated with the BioLight. With Dr. Sommer’s brainwave frequency entrainment sessions, eight unique user modes, and full biofeedback sensitivity control, combined with the lightframes, headphones and biofeedback finger probes, Theta Technologies offered a truly beneficial biofeed-in / biofeedback system well worth the $249 retail price. First there was the Synetic Systems (now known as Mindplace, the manufacturer of Proteus, Procyon and Kasina mind machines) Polysync cassettes, then came the Mind Gear Turbosonix CDs and finally Audiostrobe CDs came into existence. The Turbosonix CDs just couldn’t compete with Audiostrobe. Mind Gear produced a 3 CD set containing ten different Turbosonix sessions. Each session was perfectly synchronized with strobe light encoded sessions so you could enjoy light and sound mind machine brainwave frequency encoded entrainment simply by using your CD (compact disk) player. That was quite a feat for the technology of that time, which was only fifteen to twenty years ago. I know, that’s a lifetime for millennials, but a blink of an eye for us older light and sound brainwave frequency mind machine users. So today, Mind Gear (also known as Mind Tools) makes the only bluetooth light and sound brainwave generator to be licensed by Apple. It’s called the MindLightz, comes as an iTunes app that is free to download. And all you need purchase are the bluetooth light frames and headphones. And as for synchronization, all you need do is use your Apple device’s playlist. The MindLightz is extraordinary, with plenty of manually controlled functions, pre-sets, and the entrainment effects are excellent.